Once you pass through Rosamond, California heading east you start to come into the dry lake beds of the high desert country. This is Edwards Air Force Base. During the monsoon season here the water collects on the lake bed floor but soon evaporates. The motion of the water and the wind on the lake bed floor makes it perfectly flat and very hard. A natural, hard-surfaced runway which goes on in all directions. This is where Chuck Yeager broke the sound barrier and every famous American aircraft since the end of World War II underwent Flight Test here. The Space Shuttle still lands there when weather conditions in Florida make Canaveral unavailable. Security is taken seriously here. At the West Gate I had to show a photo ID and state my business. The Air Police called to confirm. During this process a black Mercedes sped by while the driver held some form of ID out the window. The Air Police could not read the ID at 45 mph so four of them with loaded M-16s got into a military vehicle and gave chase while another radioed ahead. They caught the offender who proved to have a very cavalier attitude. 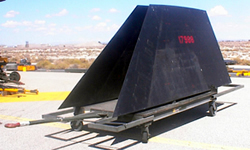 After my business was confimed, the remaining Air Police gave me clear directions to the unrestricted part of the air base where our SR-71, a loan of the United States Air Force Museum, sat parked. Soon enough I saw our bird, tail # 617968, sitting on an abandoned runway painted with a big X to show it was closed. It was sitting with other aircraft belonging to the base museum. I parked the van and began my walkaround. The Blackbird was very dusty but essentially intact missing only its tails, engines, a couple of small panels and assorted panel screws. The tires looked scruffy but the red lines embedded in each tire indicating the need for change were not showing. I couldn't get up to the cockpits but they looked undisturbed since Kent Burns, Chief Engineer of Lockheed's SR-71 Project and I had last looked in them this past July. I knew where the tails were and we were working with Tom Brewer of the United States Air Force Museum to secure a J-58 engine for display. The sound of diesel truck engines signaled the arrival of the first contingent of the World Wide Aircraft Recovery crew. We shook hands and introduced ourselves. Among them was Ben Natrass who runs the operation. He surveyed #617968 and pronounced himself pleased with its overall condition. He has already moved several other Blackbirds. We spent the rest of the day unloading the trucks and arranging their contents on the ground just so for easy access. Ben took the time to advise me that as as the project got underway to approach each piece of scrub underbrush, stack of wood or pile of equipment as if it contained a rattlesnake hiding from the sun. He spoke to the difference between Virginia's humid heat and the desert dry heat and the importance of keeping hydrated. Any major curatorial project involves a lot of preparation, coordination and often a lot of tedious, careful work. This morning is no different. 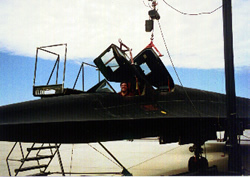 Our SR-71 had been in strategic reserve and as such had some devices with slights amount of radioactivity and ejection seat components that had to be removed and disarmed. 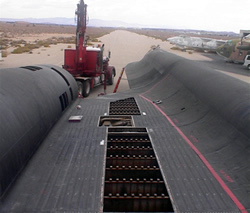 Specialists from Worldwide Aircraft Recovery and Lockheed had to remove the canopies to gain access to these areas. The Lockheed representatives disabled the ejection seats while the United States Air Force Museum representive swept the aircraft for radiation. By early afternoon our Blackbird was pronounced safe for museum exhibit purposes. From now on, the bulk of the work is to prepare the aircraft to travel the breadth of the continent by truck. This is the tedious part. Not only does each part have to be carefully, even lovingly removed but also carefully documented for reassembly at the museum. Consider this, less than 50 SR-71s were ever made. Many of the parts are still high-tech today The tools and dies to make these parts no longer exist so there is no room to do anything that will call for replacement parts because there are none. As I observe, the Worldwide Aircraft Recovery crew meticulously starts to unscrew and bag hundreds of titanium screws that hold panels to the upper wing. Unscrewing these screws too fast cause them to seize in their holes so they are removed very careful. The work is done with hand tools. The day wears on under the hot sun but the work continues steadily, meticulously. As the afternoon draws to a close the storm clouds that have been building draw near. Thunderstorms in the desert are beautiful. A thin veil of rain drapes across the southwestern sky and slowly expands in our direction. As the storm draws ever closer the pelting rain and wind drives a rolling cloud of dust before it. We secure the Blackbird and cover the canopies. Equipment is stowed and ladders put on their sides. For a second I consider climbing back on the aircraft and scrubbing as much of her down as I can in the free shower. A nearby bolt of lightning extinguishes that foolish thought and the rain rolls over us. We pause long enough to make sure our coverings remain in place and then we retreat for the day. Another long day on the desert floor. No breeze to speak of. Edwards Air Force Base and the San Gabrial and Tehachapi mountains shimmer in the distance. Unlike Virginia, this heat is a dry heat with none of the annoying clamminess of tropical air. Most of the moisture we experience in the atmosphere in the east flows up from the Gulf of Mexico or the Atlantic Ocean. The mountains of California block most of the moisture from the Pacific which explains the high desert country east of the mountains. The low humidity is perfect for the physical preservation of metal objects. Just northwest of Edwards Air Force Base is the Mojave Airport where lots of airliners sit in perfect, if faded and dusty preservation. The World Wide Aircraft Recovery crew and myself spend most of our day undoing a variety of fasteners. They are preparing the wings for removal. 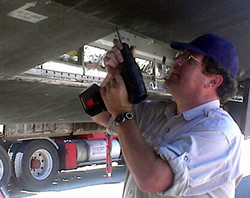 Ben Natrass has me remove the sensor bay access panels to confirm there are no sensors remaining and even more importantly to confirm that there is nothing in place acting as ballast. 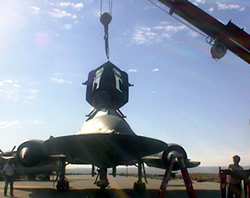 The Blackbird is heavy enough even with the engines removed. This is a slow and deliberate process. As the day unrolls a variety of aircraft pass overhead from the Aero Club's Cessna 152 trainer to the C-17 transport to assorted F-16 and F-15 fighters to the newest Lockheed-Martin F-22 fighter. They are backdropped by some of the finest scenery in the west and the constantly building summer thunderstorms. An occasional dust devil whirls across the desert. Over the past several days several people, mostly old Lockheed hands who were in on the birth and early operational days of the Blackbird stop by to pay homage. Much small talk is made while we attack the endless fasteners but they mostly come to stand in the presence of the legend that is their legend. No known aircraft has ever superseded their bird and they are proud. Since a handful of SR-71s are still being flown, now by NASA, all spares that will help keep those aircraft airworthy are stockpiled. Historically, when lack of funding causes a drawdown in the number of a particular type of operational aircraft, the standard procedure is to cannibalize those aircraft held in reserve. We are fortunate that the Blackbird being loaned to us by the United States Air Force Museum had been set aside to be reactivated. Although that funding was cancelled the end result is that our aircraft is essentially intact. The only major components actually missing are the engines. These J-58 engines are huge! If you look at the attached photograph you can see how they were installed and removed. The entire wing outboard the engines are simply opened and folded up. This is an elegant piece of engineering. At this writing we are still hoping the United States Air Force will come through with an engine that we can exhibit. The good news is that parts in storage are coming home to our aircraft. I was particularly happy to see both rudders complete with the "617968" neatly stenciled in red roll up on their own trailer. Other goodies are being delivered and neatly stacked ready for shipment back to Virginia where they will be reattached and exhibited. Work continued at a steady pace under an intense sun today. I wore a wide brimmed hat while taking pictures today to protect my neck and ears after burning them yesterday. More wing panels were removed prior to prepare for removing the wings from the fuselage. Residual fuel was carefully drained from the wings and stored prior to being properly disposed. All Air Force bases are very strict about the disposal of any hazardous materials.